I am mildly obsessed with swimming. I could write about outdoor swims, hotel pools and pools I’ve swum in on author tours, I could create lists of swimming books I’ve enjoyed and devise a post about London pools I’ve visited. I wish I was a better swimmer, I’m not graceful and I’m not fast, but I do love it. Today I swam in a pool I’ve not been in for 20 years: Oasis Covent Garden. I was yearning for an outdoor dip, but one for which I wouldn’t need my wetsuit or a 10 minute long shower afterwards to warm up. The Oasis has two pools, one indoor and one outdoor. There were just three of us there outside this morning, each with our own lane. I could vaguely see the other swimmers’ coloured hats through the steam coming off the water, but most of the time it felt as if I was completely on my own, swimming right in the heart of London. How magical is that? I could swim backstroke looking up at the blue winter sky and watch the clouds, or just plough freestyle. The only downside is the size, it felt a bit short and a tad shallow for me to be able to switch into a good rhythm. I didn’t take a photograph today as it’d have felt very intrusive and didn’t seem the right thing to do. 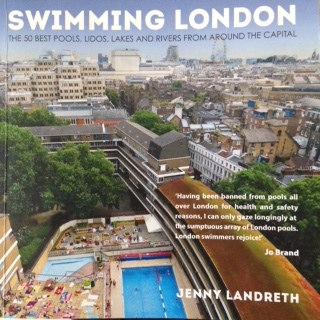 But here’s the pool on the cover of Swimming London by @jennylandreth (published by Aurum)- a book which should be on the top of every capital swimmer’s Christmas list! Visit Jenny’s blog about swimming. The changing rooms were terrible then, I thought it was an urban myth that people broke into the lockers and stole gym-goers’ and swimmers’ clothes and valuables until it happened to someone in our office…. But the water was gorgeous. I used to cycle to work on Wednesday tube strike days and have a dip in whichever pool had fewest people in, and then head off to buy hot buttered toast to eat at my desk. Perfect. Midway through a long tour we had a two hour rest time in Guildford. I hurtled into M&S to pick up a costume, hopped on a bus to the pool, bought some goggles and spent half an hour gliding up and down in Guildford Spectrum’s competition pool. I am sure I was a much better publicist and tour companion as a result of that swim, and from then on I always packed a swimsuit and goggles in my tour bag.